FREE economy 14mm compounding head. Farecla G6 Advanced Dry Use Rapid Liquid Compound 1L removes up to P1500 scratch marks. A High Gloss is achieved very quickly. 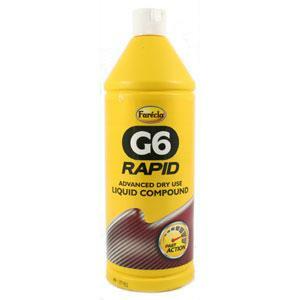 This G6 Advanced Liquid Compound doe not require water and can be used on all paint systems. It is silicone free. Ideally used with G6 compounding foam heads and back plate. Supplied in 1L.